The temperature is supposed to drop into the 20s several nights during the next week and then only rise into the 30s in daytime. That’s not unusual weather for us. We had our first killing frosts of this year a week or so ago; that’s later than usual since the average first frost comes during the last week of September. Our weather has been generally warmer lately, but now the time to shift into cold weather mode is upon us. So today was a good time for us to harvest those few goodies still lingering in our garden. Beans were first on the list. We got a late start on planting many things this year, so scarlet runner beans and Christmas limas were still hanging on our wonderful bean arch. The heavy wire cattle fencing panels arched across two raised beds and the walkway between gives us an arched trellis about six and a half feet high, eight feet wide, and twenty four feet long. We can walk through the shady tunnel picking beans on each side and over our heads. Our delayed planting meant the plants did not reach full production this year, but we still got a good picking and enjoyed some for supper tonight. Carrots, beets, and chard were also ready for this pre-cold weather harvesting. We were impressed and delighted with both the carrots and beets. We had thought neither crop was going to amount to much, so we were quite surprised when they were pulled from their hiding place beneath the soil to reveal some of our best looking roots ever. More good eating to look forward to on the coming winter nights. There was also corn to be picked. 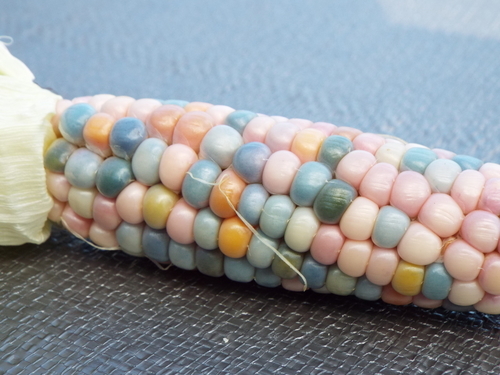 This was not sweet corn; that had already been harvested and enjoyed earlier in the garden season. 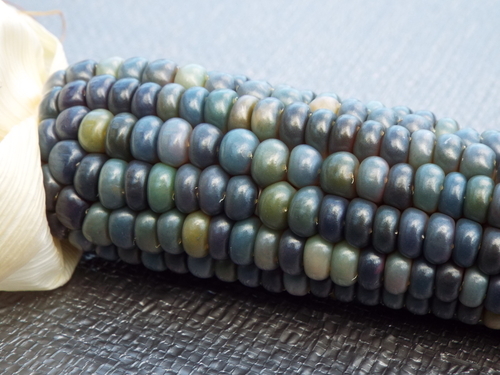 No this was what many people consider ornamental corn, used purely for decoration; however we harvest it dry to be ground with our small hand mill. We first tried this several years ago and discovered it makes the most delicious cornbread ever, with a wonderful chewy texture like no other. 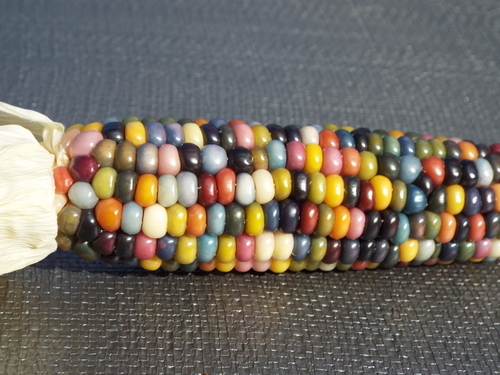 We had almost decided not to bother saving this corn crop. The late start coupled with some severe windstorms had left most of the stalks looking quite unpromising. The stalks were tall, but most had been blown over at a forty-five-degree angle and were twisted; the ears also seemed smaller and much less developed than in previous years. But since it was there, I picked it. It wouldn’t hurt to at least see what we had. What a delight when I started pulling back the shucks. The ears were small and they were not very fully developed. But they were beautiful! Every ear was different, gorgeous mosaics in incredible shades of blues, burgandies, reds, yellows, pinks, whites, greys, and greens. I could hardly wait for the revelations of each new ear. And even the silks were a marvelous golden honey color, shining like silken strands of hair in the brilliant autumn sunlight. We hang the dried ears by their pulled-back shucks from a line stretched between two posts in our house, perfect decorations while awaiting their use in the cornbread. 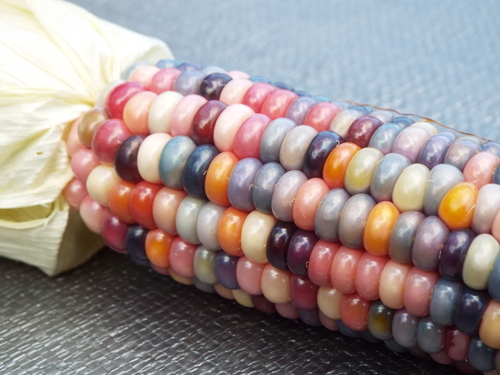 As I was working with the corn (not really work, but pure pleasure), I was thinking how good it would be if everyone had at least a small garden, growing some of their own food, and participating in the cycle of planting and tending and then harvesting their crops. In this time when apparently many young people and even adults have no idea where many of our fruits and vegetables come from and what is involved in producing the food we eat, wouldn’t it good to have that link to the earth, the source of our sustenance. I also thought with gratitude of those ancient ancestors back when our predecessors were hunter-gatherers. Over the course of untold ages those people closely observed the world around them and learned from the processes of the natural world. Those people saw how plants produced the food they consumed and realized they could use those processes to feed themselves. They developed the basics of agriculture, expanded it, improved it. How good it is to continue along that path they began. I was just picking corn. But it was really so much more than that to me.